When I was in Barcelona recently this egg and potato dish was one of the most delicious tapas we ate-and, in the interests of research, we did our best to sample many. It’s one of those dishes that looks like a dog’s dinner but tastes divine. 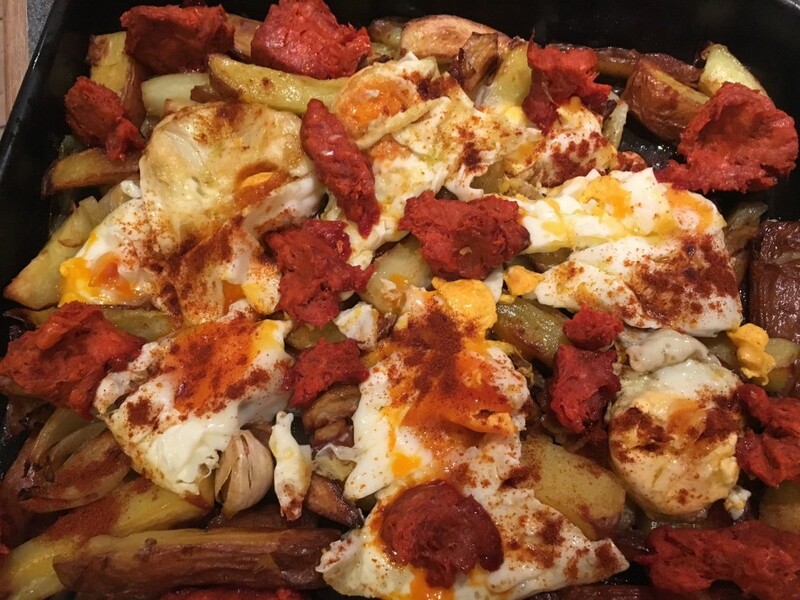 Don’t judge a book etc…This is not an authentic version because in Spain the potatoes were fried in oil and here I was aiming for a (slightly) healthier version. We ate it with sobrasada-a sort of soft pâté version of chorizo- which you can buy in good delis and online from www.thetapaslunchcompany.co.uk. 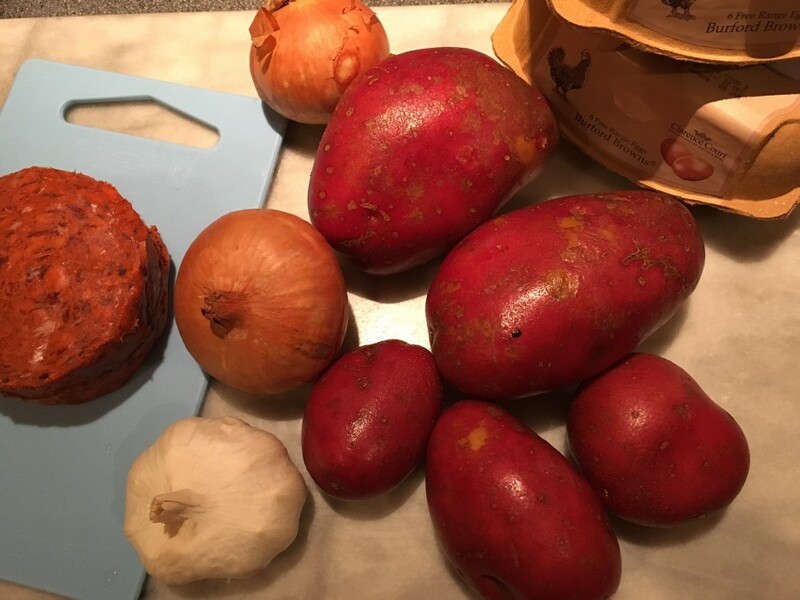 If you can’t find sobrasada you could fry some chorizo before frying the eggs. Heat the oven to 220˚c, fan oven 200˚c, mark 7. 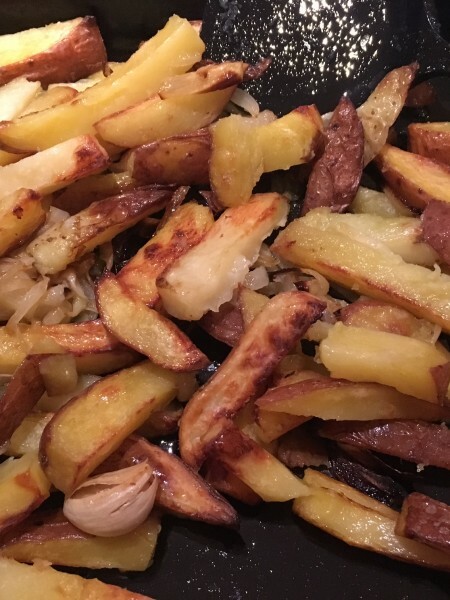 Cut the potatoes into rough, chunky chips –don’t bother to peel them. Put them in a saucepan and cover with cold water. Bring to the boil and cook for about 5-7 minutes or until they are almost cooked through. Drain well and put into a large roasting tin (or two smaller ones). Add the onions and garlic cloves and pour over half the olive oil. Season well with salt and ground black pepper and toss to coat the potatoes in the oil. Cook for 45 minutes, turning the potatoes halfway through cooking. Transfer to a serving dish and lower the oven to 140˚c, fan oven 120˚c, mark 1. Keep the potatoes warm while you fry the eggs. Heat the remaining oil in a frying pan and, if you are frying chorizo, cook for 3-4 minutes until crispy. 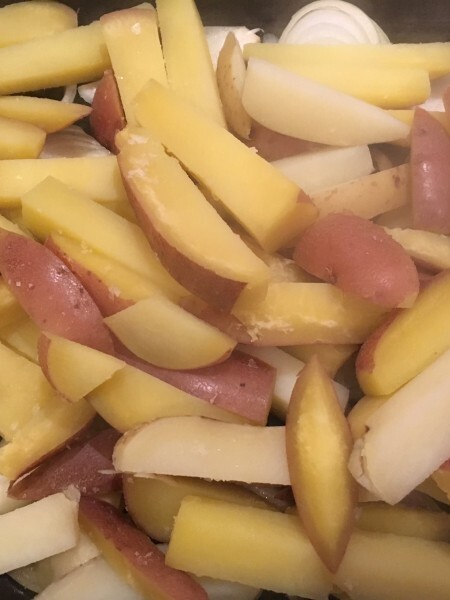 Remove with a slotted spoon and add to the potatoes. Fry the eggs for 2-3 minutes until the whites are a little crispy but yolks soft. Flip over and cook for 20 seconds. Lift out of the frying pan and lay on top of the potatoes, breaking the yolks as you go (hence the title of the dish –broken eggs). Sprinkle with smoked paprika and serve immediately-perhaps with some padron peppers.